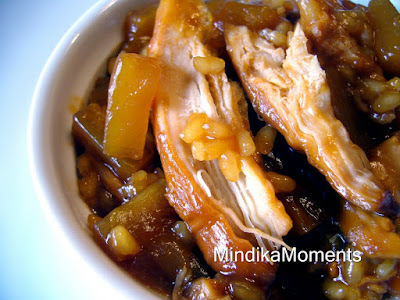 Mindika Moments: Is there something easier than the crock pot?? Is there something easier than the crock pot?? For some reason I was extra exhausted this Sunday after church. I tell you...aside from the Bishopric, I think Nursery Leader is the most exhausting Sunday calling. Even crock pot recipes seem to be to much work for me these days. I'm trying to figure out a way to cook a good meal where the dishes will do themselves, and I can come home and absolutely do nothing but lay on the couch! The closest idea I've come up with is tin-foil dinners. I may be doing some experimenting in the near future. In the mean time...this crock pot recipe is something I came up with last Sunday. It's a combination of a couple baked oven recipes I had. It turned out pretty well. 1. In a sauce pan, over medium-high heat, combine sugar, soy sauce, pineapple juice, ketchup, vinegar, and mustard. Bring to a boil and cook until ingredients are well combined, about 3-4 minutes. 2. Place chicken in the crock pot and pour the sauce over top. 4. One hour before the chicken is done, add pineapple and rice. *If using minute rice, add the pineapple at 1 hour but add the rice just 10 minutes before serving. I like the idea of tin-foil dinners...got any good recipes for those? Can't wait to hear them! Everything looks so delicious and inspiring! Looks delicious! I agree with you on the nursery calling. We only have to do it some weeks (we also do Webelos (10 year old scout, which is also incredibly exhausting! ), and the weeks we do it I always come home so tired that I just want to lay on the couch and let my two little girls fend for themselves.